On-air challenge: Every answer is a familiar two-word phrase with the consecutive letters of S-H-H. Specifically, the first word in the answer will end in SH, and the second will start with H.
Last week's challenge: Think of a business that's found in most towns. Its name consists of two words, each starting with a consonant. Interchange the consonants and you'll get two new words — neither of which rhymes with the original words. What business is it? Winner: Tom Serb of Woodridge, Ill.
Next week's challenge from listener Henry Hook of Brooklyn, N.Y.: Think of a well-known celebrity who goes by a single name — the last two letters of which are alphabetically separated by only one letter (like A and C, or B and D). Replace this pair of letters with the one that separates them, and you'll have a common, everyday word. What is it? This is WEEKEND EDITION from NPR News. I'm Wade Goodwyn. Let's get ready to puzzle. No, it's not boxing, but it's like boxing, so keep your hands up as we play the puzzle. And joining me now is Will Shortz. He's, of course, the puzzle editor and boxing coach for the New York Times and WEEKEND EDITION's puzzle-master. Good morning, Will. WILL SHORTZ, BYLINE: Good morning, Wade. GOODWYN: So, Will, refresh our memories. What was last week's challenge? SHORTZ: Yes. I said think of a business that's found in most towns. Its name consists of two words, each starting with a consonant. I said interchange the consonants and you'll get two new words, neither of which rhymes with the original words. What business is it? And the answer was car wash. Switch those letters, you get war and cash. GOODWYN: Very clever. Well, more than 900 loyal listeners figured it out. And our randomly selected winner this week is Tom Serb of Woodbridge, Illinois. And he joins us on the line now. Tom, congratulations. TOM SERB: Why, thank you, Wade. GOODWYN: So, Tom, I gather this was your first time playing the puzzle? How did you find it? SERB: I belong to Mensa, and there is an American Mensa group on Facebook. Someone had posted last week's puzzle and I thought that looks interesting. And I went to the NPR website and solved the puzzle. GOODWYN: Mensa, the high IQ society. Wow. I've always wanted to join but you'll understand, we have to ask, what's your IQ? SERB: You know, I honestly don't know. It's been tested a number of times. It's pretty high. I believe it's over 160. GOODWYN: One-sixty, wow. Well, you should have no problem. Without further ado, Tom, are you ready to play the puzzle? GOODWYN: OK, Will. Let's play. SHORTZ: All right, Tom and Wade. You'll have to be quiet for today's puzzle. That's because every answer is a familiar two-word phrase with the consecutive letters S-H-H, as in shh. And specifically, the first word in the answer will end in S-H and the second will start with H. For example, if I said a Celtic stringed instrument, you would say Irish harp. SHORTZ: All right. Number one is period in the morning and evening when traffic is busiest. SHORTZ: That's right. Number two: former name of Belize. SHORTZ: That's it. Headwear for a motorcyclist or race car driver. SHORTZ: Good. Yom Kippur or Hanukah. SHORTZ: Well, hold that answer 'til later. But those are not the same as Rosh Hashanah. What are Yom Kippur and Hanukah examples of? SHORTZ: There you go. Place to throw garbage. SHORTZ: That's right. Also ash heap or rubbish heap would work. Place to stick a worm. SHORTZ: Um-hum. Woodwind instrument resembling an oboe. SHORTZ: There, I thought you would get that. A cheap restaurant or a diner. SHORTZ: Good. Instruction above a sink to restaurant employees. SHORTZ: Good. Best-selling song by a wide margin. It's like a number one song or even bigger than that. You'd call it what? SERB: Oh, a smash hit. SHORTZ: A smash hit. How about the Jewish New Year? SHORTZ: There you go. Building next to a church used for social activities. SHORTZ: Good. 1960s, '70s pitcher for the A's and the Yankees who played on five World Series-winning teams. SHORTZ: Ah, I'm impressed. Good. Elevated, far north part of the British Isle. And it's where people wear kilts and play bagpipes. SHORTZ: Scottish Highlands is it. Part of upper Manhattan with a large Latino community. And, Wade, you used to live in New York. GOODWYN: Yeah, let's see. Spanish Harlem? SHORTZ: Spanish Harlem, good. And here's your last one: a place to call if you need tech assistance for an Apple computer. SERB: I'm afraid I've never owned an Apple. SHORTZ: Well, that's OK. It's nothing specialized here. What's an Apple computer in general? SHORTZ: Macintosh help is it. Good job. GOODWYN: Tom, you're a genius. SERB: I suppose some people think so. GOODWYN: Great job, Tom. And for playing our puzzle today, you'll get a WEEKEND EDITION lapel pin as well as puzzle books and games. You can read all about it at npr.org/puzzle. And, Tom, tell us your public radio station. SERB: WBEZ 91.5 in Chicago. GOODWYN: Tom, sir, genius of Woodridge, Illinois, thanks for playing the puzzle this week. SERB: Thank you, Wade. Thank you Will. GOODWYN: OK, Will, what do you have to puzzle us for next week? 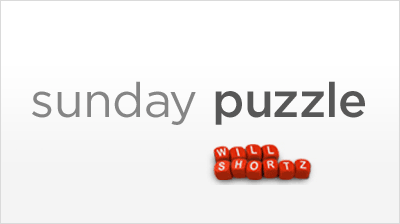 SHORTZ: Yes, this week's challenge comes from listener Henry Hook of Brooklyn. Think of a well-known celebrity who goes by a single name. The last two letters of which are alphabetically separated by only one letter, like A an C or B and D. Replace this pair of letters with the one that separates them and you'll have a common everyday word. What is it? So again, a well-known celebrity with a single name, last two letters are alphabetically separated by only one letter. Change those two to the letter that is between them and you'll get a common, everyday word. Who's the celebrity and what's the word? GOODWYN: When you have the answer, go to our website, npr.org/puzzle and click on the Submit Your Answer link. Just one entry per person, please. And our deadline for entries is Thursday, September 5th at 3:00 P.M. Eastern. Please include a phone number where we can reach you at that time, and if you're the winner we'll give you a call and you'll get to play on the air with puzzle editor of the New York Times and WEEKEND EDITION's puzzle-master, Will Shortz. SHORTZ: Thanks a lot, Wade.